Android phones will eventually get these new features (if they get updated) but some are Pixel exclusives. Our first look at Android 7.1 came courtesy of the Pixel phone, but now we’re learning more about what sets it apart from the first iteration of Nougat. Night Light: Cuts down on blue light emitted by your display late at night, which is easier on your eyes and won’t mess your your melatonin production, keeping you up late. Touch/display performance improvements: This is one of the reasons an iPhone “feels” faster than the typical Android phones. Google wants to fix this through some dark magic that accelerates how responsive the touchscreen is to your finger. Seamless A/B system updates: This should eliminate the need to hit the update button and wait for an install. Android updates will come in the background and automatically install on your phone when it’s not in use. Daydream VR: Phone that support the Daydream Ready spec requirements will work with the new VR headsets (the first of which is Google's Daydream View). Fingerprint swipe: You’ll be able to check your notifications with a quick downward swipe on the fingerprint sensor. 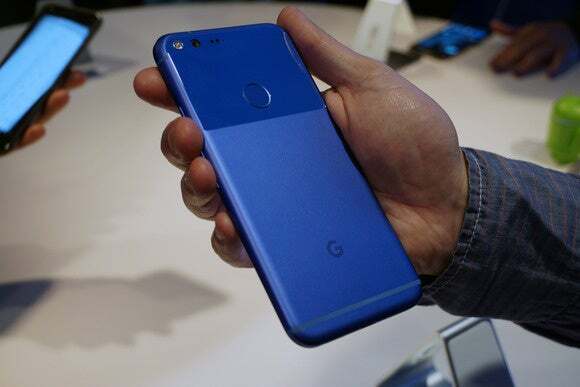 Developer features: The following are targeted at developers, giving them access to many of the feature and design changes that we saw in the Pixel update to Android. Pixel Launcher: This will remain exclusive to the Pixel, unlike the Google Now Launcher. You swipe up to get to the app drawer, which also offers a search box for finding apps. Google Assistant: On the Pixel, this is launched with a long press of the home button. You’ll have to try it out inside of Allo if you want to check it out now. Google Photos: Pixel owners get unlimited, original quality backup of all photos and videos. Smart Storage: When your phone is running low, it will automatically remove the original version of saved photos and videos. Support: The Pixel will will come with 24/7 support including a screen share feature accessible through the support tab in the settings. Quick switch adapter: A wired setup to transfer contacts, photos, and messages (even from iMessage!) from your current phone to a Pixel. Aesthetic changes: A new calendar and date icon, pull-out “pill” to launch a Google search, and new wallpapers. Maybe some new lock screen animation, too. This story, "Here's everything new in Android 7.1" was originally published by Greenbot.